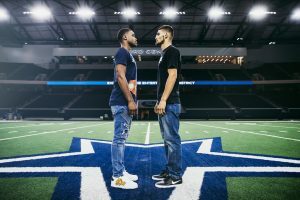 Errol Spence Jr., the man many consider to be the top welterweight in the world, returned to his home state of Texas in Frisco at the Ford Center to defend his IBF Welterweight Title against his mandatory challenger. The Dallas Cowboys Organization strongly supported Errol Spence’s return to his hometown. The opening bout of the night was between Javier Fortuna (33-2-1) and Adrian Granados (18-6-2) in the super lightweight division. Fortuna was former champion in the super featherweight division and is fighting up to two weight classes higher than he normally does. Granados had both a reach and height advantage and it was obvious in the ring. Grandaos was on the attack early on and landing shots to the body. Fortuna was sharp with his straight left hands and was landing the cleaner shots early on. Fortuna continued to land the cleaner punches in the second round but Granados was using his size to push around Fortuna. Granados had a good third round and again was using his size to his advantage. Fortuna lost two points this fight for holding, but those points may have been taken away too early. The fight came to a sudden end in the fourth round when Fortuna was pushed out the ring in between the ropes and may have hit his head on the ring steps on equipment outside. They had to place his neck in a brace and get a stretcher to take him to be evaluated. The official result of the fight was a no decision due to a fighter getting hurt before the end of the fourth round. The fight was stopped at 2:50 of the fourth round. The next bout of the night was between Daniel Roman (24-2-1) and Moises Flores (25-0) for the WBA Super Bantamweight Title. Flores came in overweight at the weigh ins and looked like the significantly bigger man in the ring. Flores was swinging wildly and wide early on and Roman appeared to be more settled. Roman highlighted the opening round with a good lead right hand left uppercut combination. Roman was focusing to the body for most of the fight and was doubling his left hooks and uppercuts in the second and third round. Flores kept coming forward in the fourth and fifth rounds, but Roman’s counters were finding his target while he was able to side step around his oncoming opponent. Most of Flores punches bounced off the shoulders and guard of Roman in the sixth round, but he had a good seventh round and may have stolen it. By the ninth round both boxers had thrown over 1000 punches combined but Roman was landing at a higher clip Roman was lighter on his feet in the tenth round and his body shots had slowed Flores down tremendously. Flores needed a knockout in the final round to pull out a victory, but he didn’t have enough energy to seriously threaten Roman. The final scores were 116-112, 118-110, and 120-108 for Danny Roman. The main event of the evening was between Errol Spence Jr. (23-0) and Carlos Ocampo (22-0) for the IBF Welterweight Title. This was the first world title fight for Ocampo against the highly talented southpaw Errol Spence. Spence slowly inched forward in the opening stanza and took some surprisingly good body shots from Ocampo. Spence was able to land a good straight left to the chin of Ocampo that slowed him down momentarily, but Ocampo was making a good showing of himself early on. With time running out in the first Errol Spence landed two blistering hooks to the body of Ocampo that immediately dropped him to his knees. Ocampo was unable to get up before the count of ten. Errol Spence wins by knockout with one second left in the first round. On Saturday night Errol Spence Jr., a man many consider to be the world’s top welterweight and one of the world’s best pound for pound fighters, will be making his mandatory defense of his IBF Welterweight title against Carlos Ocampo. Spence will be returning to his home state of Texas to make his title defense. This fight card will take place at the Dallas Ford Center. The co-feature of the evening will be a WBA Junior Featherweight bout between Danny Roman and Moises Flores. Other prospects will also be appearing on the undercard including former world champion Javier Fortuna, Yordenis Ugas, Roberto Marroquin, and Stephen “Scooter” Fulton. The following is a preview of the televised fights. The opening bout of the night is between Danny Roman and Moises Flores for the WBA Junior Featherweight Title. Roman is twenty eight years old and three years younger than his opponent, but will be giving up three and a half inches in height and an inch and a half in reach. Roman is also the lesser puncher of the two. Flores has seventeen stoppages in his career compared to the nine stoppages that Roman has. Neither boxer has a notable amateur career to discuss. Roman has been more active than Flores. He fought once in 2018, twice in 2017, and four times in 2016. Flores only fought once in 2017, and one round at that against Guillermo Rigondeaux, and once in 2016. Flores lone blemish on his record was a no contest against Guillermo Rigondeaux, but he was getting badly beaten at the time and the referee actually originally ruled it a stoppage victory for Rigondeaux before it was later reviewed and ruled a no contest due to punches landing after the final bell. Flores has beaten the likes of Paulus Ambunda, Luis Cusolito, and Oscar Escandon. Roman had to travel to Japan to win the WBA title. He has defeated the likes of Ryo Matsumoto, Shun Kubo, Adam Lopez, and Christian Esquivel. Flores long layoff, which includes a very brief encounter with Guillermo Rigondeaux, will hurt him against a younger opponent. Roman isn’t known for his power, but his last loss was on 2013 and he has won sixteen fights in a row. Roman likely won’t win by stoppage, but he should win a decision. Errol Spence is one of the top stars in the welterweight division and has held the IBF title since his thrashing of Kell Brook in May of 2017. He’s looking for a big fight and a matchup with either Terrance Crawford or Keith Thurman is a fight that most fight fans are looking forward to. However, he first has to take on his mandatory challenger, on paper a clearly overmatched Carlos Ocampo. Spence is a tall, rangy southpaw, and is in the midst of his prime at 28 years old. Ocampo has been relatively unchallenged as a professional and is only 22 years old. Spence had a highly successful amateur career and competed in the 2012 Summer Olympics. Ocampo experienced some success on the Mexican amateur circuit, but not on world circuit. Spence also has the edge in power. He has twenty stoppages on his record, including ten wins in a row. Ocampo only has thirteen stoppages to his record, and only has one stoppage win in his past four fights. Spence has beaten the likes of Lamont Peterson, Kell Brook, Leonard Bundu, Chris Algieri, Chris Van Heerden, Phil Lo Greco, and Ronald Cruz. Spence fought once in 2018, once in 2017, and twice in 2016. Ocampo’s biggest victories to date were over Jorge Paez Jr. and Charlie Navarro. He has never fought outside of Mexico. He fought twice in 2017 and three times in 2016. Spence should win this bout relatively easily, and will likely get another stoppage victory.